It was time for our annual office Xmas party and my boss wanted to do a Family Feud type game. He asked me to build a simple game show buzzer like on the show. I received an adequate budget but I only had about a day to complete the project. With only a vague concept in my head, I drove to a surplus electronics shop. Since I had very little time I was determined to buy everything at once and there was definitely no time for mail order. Below is the final result. 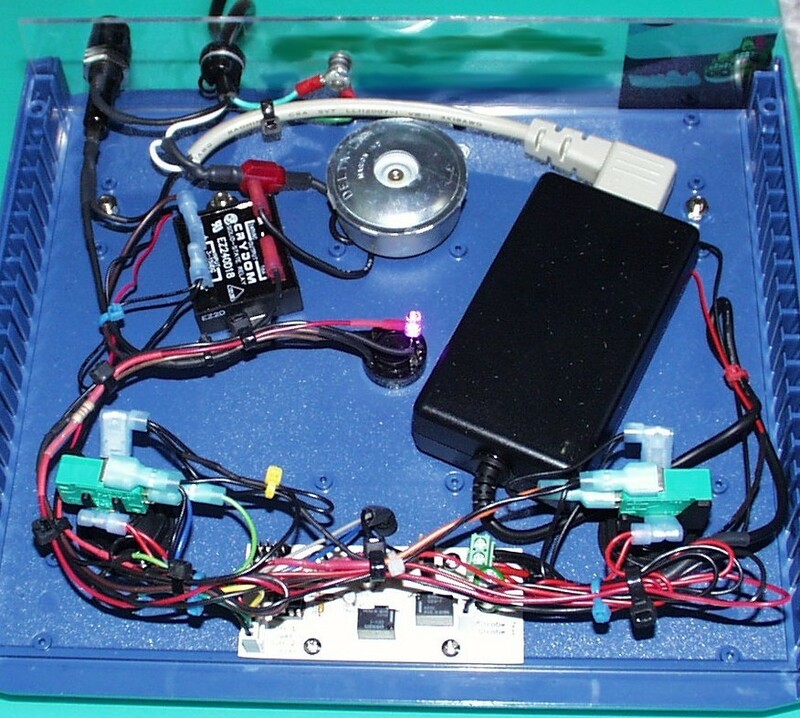 There are two large 2″ illuminated arcade pushbuttons and two Xeon strobe lights. 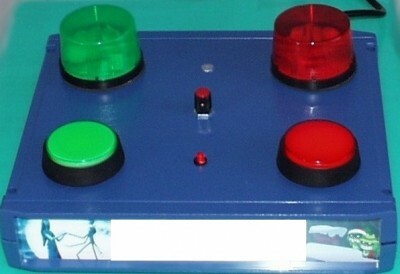 The first button pressed activates the corresponding strobe and locks out the other. 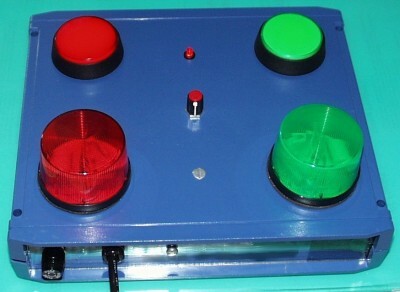 Pressing the buttons also switches a loud buzzer. The surplus blue case was a bargain and just the right size. It didn’t have any front or back covers, so I cut 2 pieces of acrylic, which also serves to hold some XMAS graphics. Here is a Pov-Ray 3D model of the circuit. I chose an Atmel ATTiny 45 microcontroller because I had several in my parts bin. I didn’t need the 4K but I was out of ATTiny25 chips. 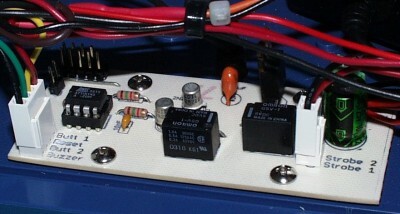 The small 5V Omron relays are used to control the 12V Xeon strobe lights. Here is a shot inside the completed unit. A 12V DC laptop adapter powers the button lights, strobes, LED’s and feeds the circuit board which steps down to 5V. The adapter was too expensive, but it was all I could find that would fit. I need 110V AC inside the case to fire the buzzer. Here is the Cadsoft Eagle drawing of the 3.5″ x 1.5″ board. One bridge was necessary. The completed etched circuit board. Here are my etching notes in PDF format and this is a great website that further details the process. I tried several low voltage piezo buzzers, but they all sounded like smoke alarms. I wanted mine to sound like something on TV. I finally found an ideal sounding 2″ metal buzzer. Unfortunately, it was 110V AC which complicated my design. I considered building an MP3 circuit to use the actual sound from the TV show, but I just didn’t have the time. Fortunately, the surplus store had a great deal on solid state relays. The Crydom SSR below can easily handle the 110V buzzer and can be driven directly from an AVR pin, unlike the mechanical relays above which require a resistor, transistor and diode. Here is a shot of the back of the case. I added a fuse just to be safe. The aluminum screw on the top secures the buzzer. 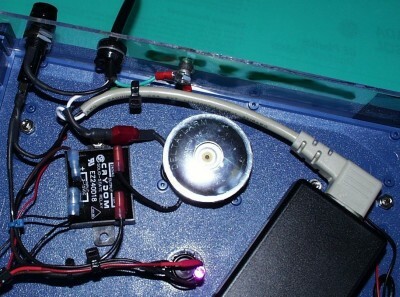 The rotary switch disables the buzzer and the super bright violet LED which illuminates the inside of the case. The small illuminated red pushbutton resets the game. The game show buzzer was a big hit at the party. It worked flawlessly and everyone liked the lights and sound. One of my colleagues actually took the buzzer home for the holidays to play games with her family.